Conjuring up a big win is the name of the game in Street Magic, the hugely volatile new slot from Play ’N Go which has just launched. As you’d expect from its name, the design in Street Magic is more Dynamo than Houdini. The reels feature playing card suits as well as a range of props a street magician might use. They include handcuffs, playing cards, padlocks and pocket watches. Top of the standard symbols is the ring which offers payline awards of up to 25 times your total stake. The best symbol in this 5 reel, 20 payline game is the street magician himself who serves as both a wild and a scatter. Land 2 of these on the same spin and you’ll be awarded a Magician Performance feature. This could be The Wild Shuffle feature where 4 extra wild symbols are added to the reels or The Expanding Man feature where the 2 magicians fill the whole of their reel (i.e. 2 wild reels). In the Transporting Man feature, the 2 magician scatters are joined by a third which triggers the Free Spins feature. You can also trigger the Free Spins feature by landing 3 magician scatters on the same base game spin. Once live, you’ll be awarded 8, 10 or 12 free spins. Hope to land at least 1 sticky wild on each reel during the feature as it delivers a retrigger. Choose from 1 of the playing cards to see whether it’s another 4, 6 or 8 free spins. We’ve seen more visually impressive magic-themed slots than Street Magic. The rather unfussy design fits well enough with the gritty urban theme though. If the visuals in Street Magic are understated, you certainly can’t say that about the volatility. This is a super high variance slot with possible payouts of 5,000 times your stake on each spin/free spin! Your bankroll can disappear in the blink of an eye though. Get on a run with the wilds in the feature and you could conjure up a stash of coins in no time. That sky-high volatility won’t be for everyone. If you don’t mind the potentially big swings, then there’s plenty to like here. If you fancy some trickery while you spin, then Street Magic is one performance you won’t want to miss. Check out the Street Magic slot review for full details. 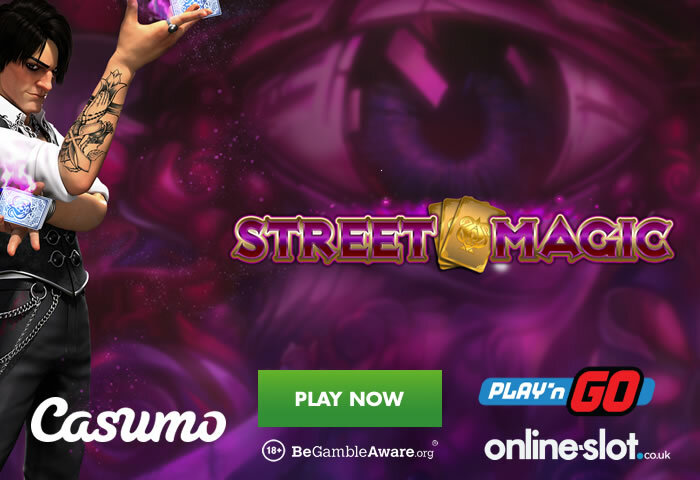 I recommend you play Street Magic at Casumo Casino – they have all the latest releases including Microgaming/Just For The Win’s Sidewinder, Novomatic’s Jaguar Moon and Quickspin’s Big Bot Crew. You also have exclusive titles such as Lightning Box Games’ Astro Pug, Thunderkick’s Jaguar Temple and Push Gaming’s Jammin’ Jars. Sign up to get 20 no deposit free spins on NetEnt’s Starburst as well as a 100% first deposit bonus up to £300.